This article originally appeared in the March/April 2017 issue. 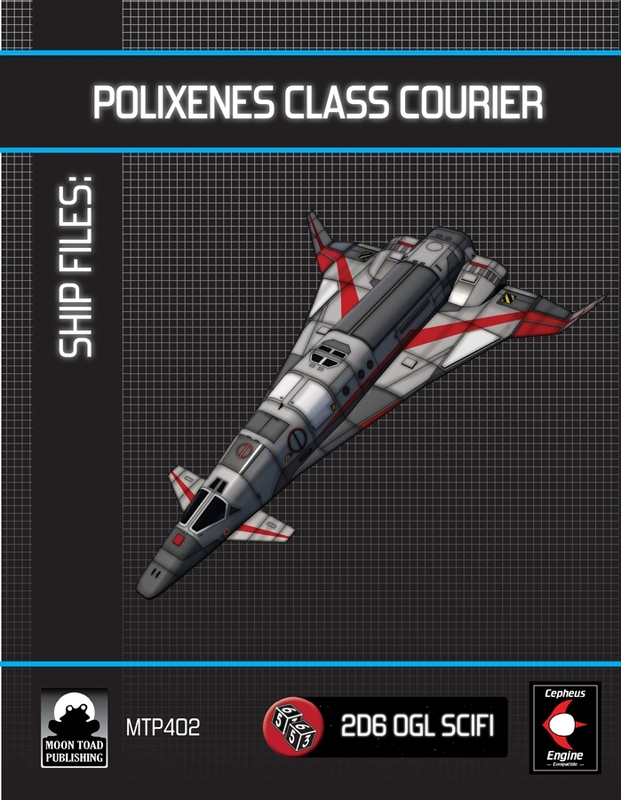 Ship Files: Polixenes-class Courier. Michael Johnson. This product is a high-quality ship book. While the background material is not as expansive as in some of the Clement Sector books, for example, this book provides a highly detailed and highly useable starship which you could easily insert into any Cepheus Engine or Traveller campaign. The 100-ton Polixenes-class Courier is, essentially, the good ol’ Scout/Courier, but in a more elegant “airframe” form. It has two variants. The main difference between them is fuel storage, with the longer-range one capable of 2-Jump-2. I wonder why it doesn’t have Jump Drive B to provide it with Jump-4 capabilities if it already has the fuel for this (I guess that this is a TL11 design?). Each variant gets a deck-plan in the book itself, and the regular variant also gets a color deck-plan. You also get the deck-plans and ship record sheets in separate, ultra-high-res JPEG files for your own printing. Everything gets wonderful renders, including several paint-job variants of the ship and an Air/Raft it may carry (in its regular variant, that is). This also includes full Cepheus Engine ship (and air/raft!) stats and ship record sheets.